Inspired by the life of rock legend Marc Bolan, the smash hit musical explodes onto the stage nearly four decades after the iconic star's tragic death. 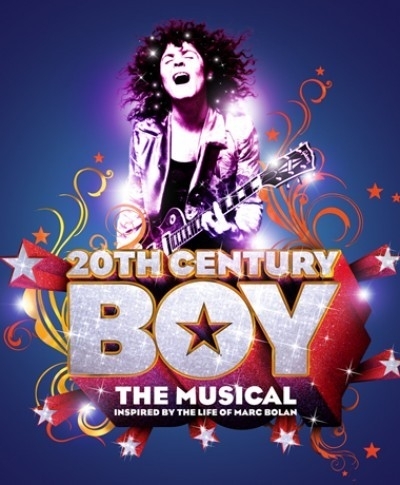 Featuring some of the greatest pop songs ever written, 20th Century Boy tells the story of Marc Bolan and his band T-Rex. Featuring the smash hits: Get It On, Ride A White Swan, Metal Guru, I Love To Boogie, Hot Love, 20th Century Boy and many more. Before his tragic death in 1977, just days short of his 30th birthday, Bolan lived life at breakneck speed, creating a series of iconic images, a string of number one hits and an army of obsessive fans. Packed with all T.Rex's 70s hits, staged by John Maher (Let it Be, Thriller Live etc ) and with a West End cast, 20th Century Boy is a glorious story and celebration of glam rock at its colourful best! Featuring the smash hits; Get It On, Ride A White Swan, Metal Guru, I Love To Boogie, Hot Love, 20th Century Boy and many more.